These adorable cupcakes are kid-friendly and easy to make if you own a Wilton tip set (or are feeling ambitious). Hope you have as much fun making them as we did! Fill each muffin cup about two-thirds full with batter and bake for about 16 - 20 minutes or as directed on box, springy to the touch, and a toothpick inserted into a cupcake comes out clean. Once the cupcakes have completely cooled, place the frosting in a piping bag, fitted with a Wilton #47 or #48 basket weave tip, and pipe lines back and forth on the top of each cupcake, leaving a small oval opening for eyes at the top. 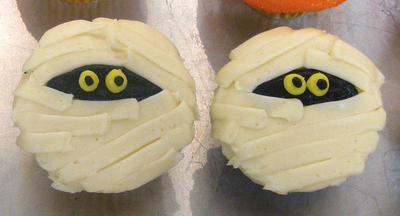 Place two candy eyes on each cupcake, or dot yellow circles, and then a black dot.